Come join us for Hyderabad’s Biggest Dosa in India as we head over to Chutneys restaurant to partake in a delicious South Indian food challenge. What made this meal so fantastic was the quality of the dosa over the sheer size of it along with the amazing spread of six different chutneys, sambar and potato mash that came as side dishes. I especially loved the coconut chutney, which was sweetened, and made it feel like I was having dessert bites. One of the true highlights was seeing how the dosa is prepared with a behind the scenes tour in the kitchen. Good afternoon guys! I’m in Hyderabad, India and as you can see behind me I’m going to be visiting the restaurant Chutneys. They make the biggest dosa here in Hyderabad. It is basically a giant Indian pancake. It originates from South India and man I’m hungry. We are going to checkout the preparation of the dosa. This is really exciting. How big is your dosa? The big one is around four feet long. It is huge. It is incredibly big. And it can be shared for 2 to 3 people. This is so amazing. I’ve never seen anything like it. I love dosa. Dosa are one of my favorite things from South India cuisine. Totally agree with you man. Have you ever had one this big? My biggest was one foot and I ate that whole thing. This is going to be four times as big. I’m going to eat the whole thing. It is a two person job. Look at that. Two people need to carry it. Wow, that is big. That is a behemoth of all behemoths. Look at the size of that dosa. Maybe the biggest dosa in all of India. The biggest dosa in the world. Right there in front of our eyes. Look at the size of that behemoth dosa. The biggest dosa. Look at that. It is like, it is like my wingspan practically. I think officially it is just under a meter. He said it was like about 4 feet. Three to four feet long and it is crazy how big it is. Like just look at how big this dosa is. Before we tuck into this beautiful dish let me tell you what a dosa is. So Dosa is South Indian cuisine. It is basically an Indian pancake it is made from fermented batter. It has just two ingredients. Rice and black gram which is a dry bean. It comes with six different chutneys, sambar which is lentils and tamarind and then a potato mash salad. First up is a coconut chutney. Over here we have peanut, over here we have green chillies with ginger and then we have red chillies with ginger over here. This one is tomato based with corn and this one is chanada. Let’s break this bad boy dosa in half. I can hear it like crunching. The thing that is amazing about it is it is kind of hollowed out. It is paper thin and you’d think oh maybe this is heavy. It is totally light in the hands. In terms of eating it I believe you’re just supposed to break off a piece a dunk it in. So I’m going to go with one of my favorite kind of chutneys coconut. I absolutely love coconut so I have a feeling that I’m really going to like this one. Let’s take it for a bite. Oh my gosh that is good. That coconut is so sweet. It is pure coconut. There is nothing else. And it is just gets absorbed so well with the dosa man. How do you even sum up a meal like this? This is just outstanding. This dosa was incredible. The size was shocking. The quality was outstanding. I couldn’t recommend this place more highly. 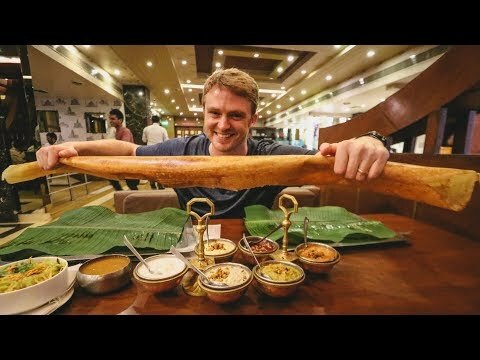 This is part of our Travel in South India video series showcasing South Indian food, Indian culture and South Indian cuisine.